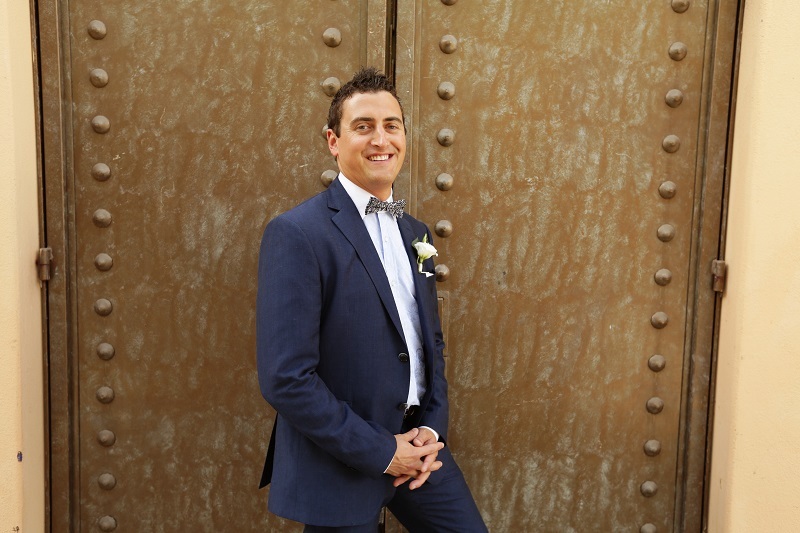 This simple, elegant wedding on the cliffs at Esperanza and overlooking the Pacific Ocean was the culmination of a whirlwind romance that began a few miles north in Vancouver, British Columbia. 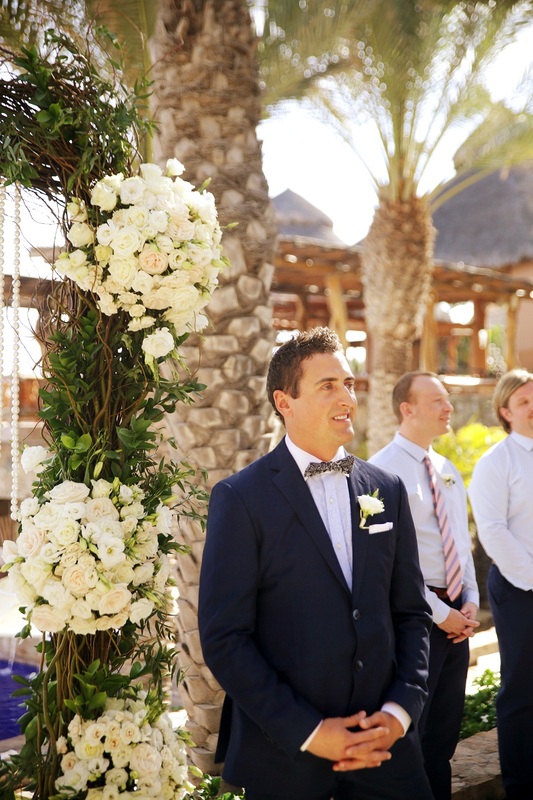 Erica and Erich, a stylish, jet setting Canadian couple, got engaged in Paris, France but couldn’t imagine their wedding anywhere else but Los Cabos, Mexico. It was a warm, sun-filled day of shared smiles and beautiful moments. 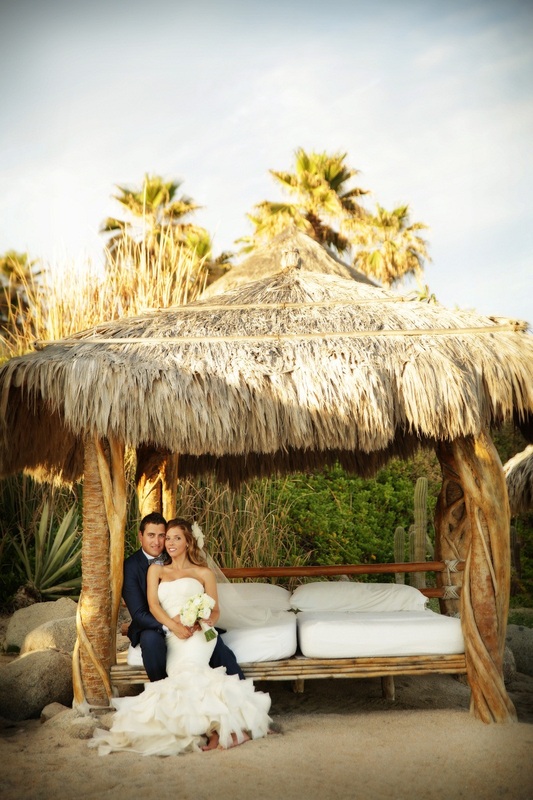 Each moment carefully planned and expressed through personal details that reflected the couple’s taste and lifestyle. Literally. 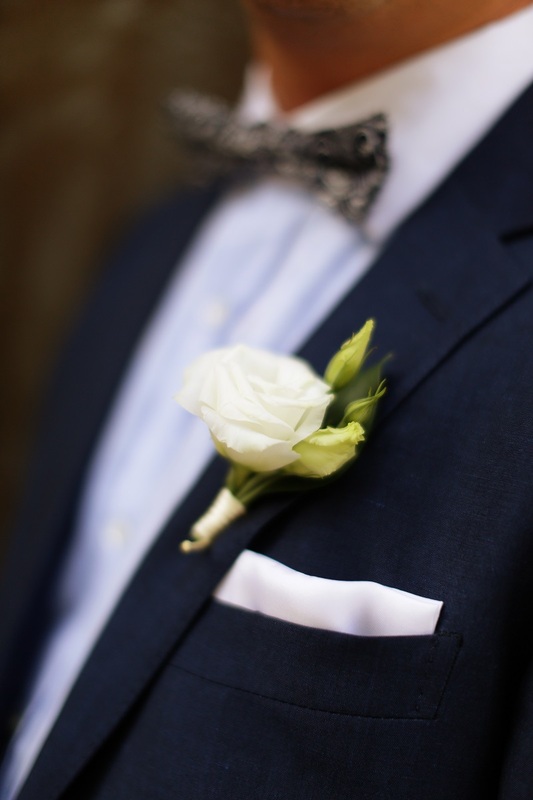 Right down to the bride’s love for pearls, flowers, fabric and fashion; as well as the groom’s tremendous foodie-centric knowledge of food and beverage. 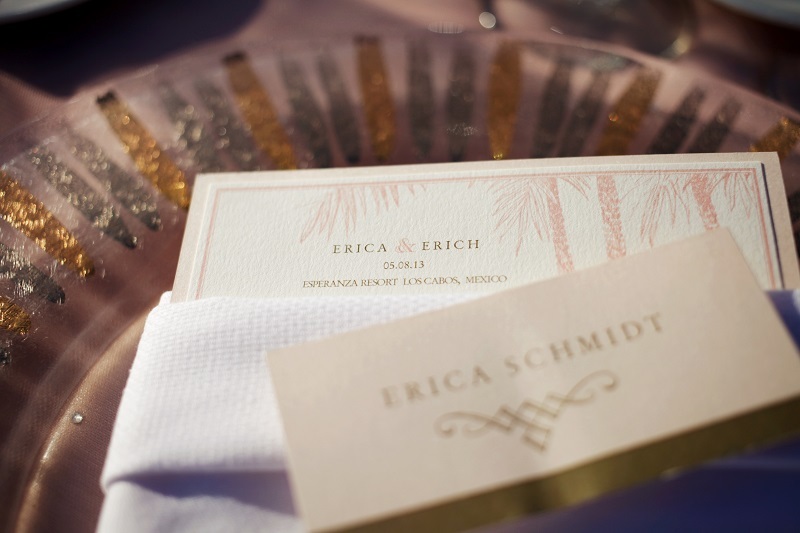 What is even more amazing, as that, like many of our clients from around the world, Erica and Erich planned their nuptials from afar. 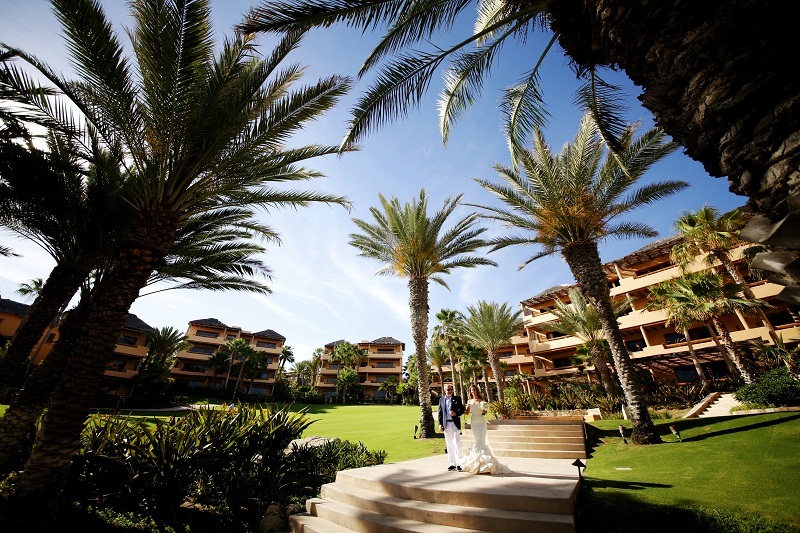 They never came to Los Cabos for a site inspection; instead, with the thoughtful help of their wedding planner, Claudia Morales, they planned their Mexican destination wedding through phone calls and Skype video chats. That’s trust! 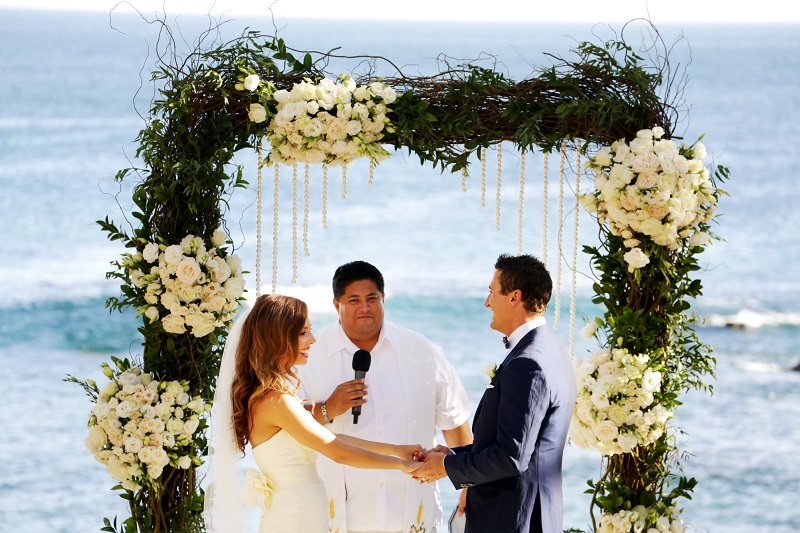 What resulted was an incredible wedding celebration that will be remembered for years to come. Such a beautiful bride! 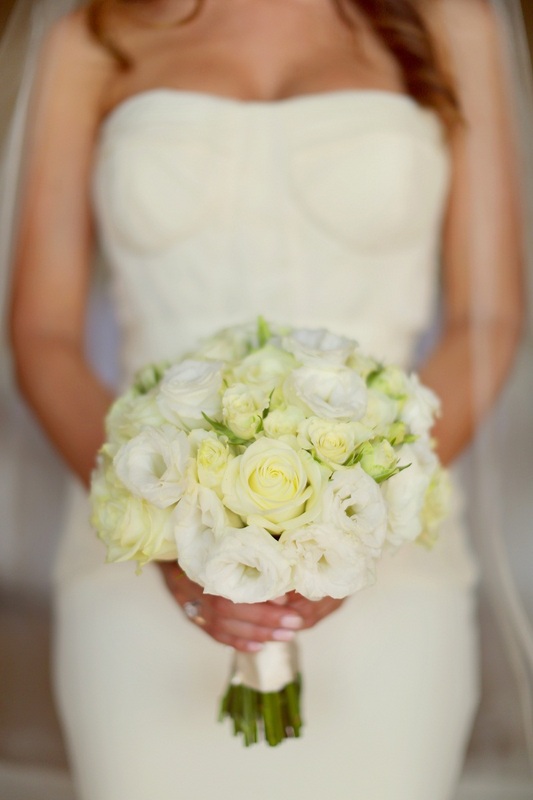 Of course, destination wedding photographers Chris+Lynn had so much beauty to work with already, but WOW! Just look at these fashion editorial photos off Erica! Gorgeous! 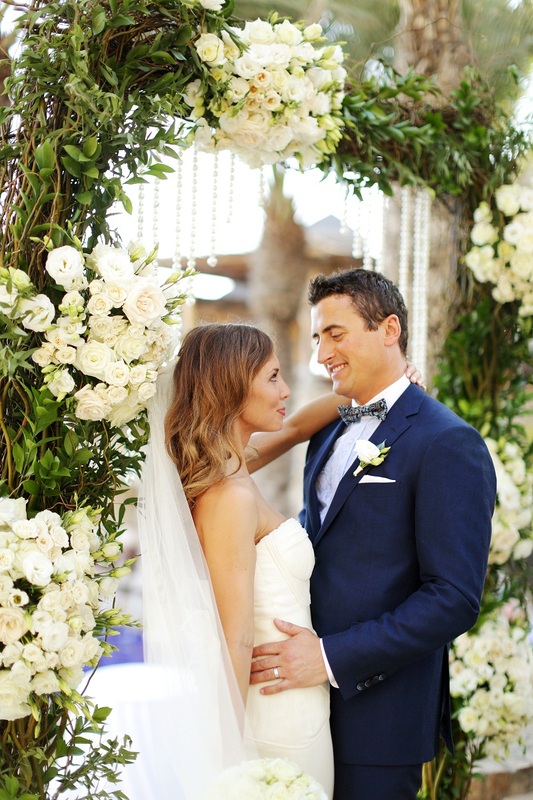 We loved collaborating with the bride, a professional interior designer, on the floral and event design. Incorporating the bride’s love for pearlescence into each aspect of the design was essential, from the pearls dripping from the ceremony arch to the pearly luster of the satin ribbon on her bouquet. Elena created a lovely hand-tied bridal bouquet for Erica using creamy ivory Garden Roses, Sweetheart Roses and white Lisianthus. The bridesmaids, wearing the chicest pink ruffled mini-dresses, carried simple bouquets of white Roses, Sweetheart Roses and wispy Smilax vines. 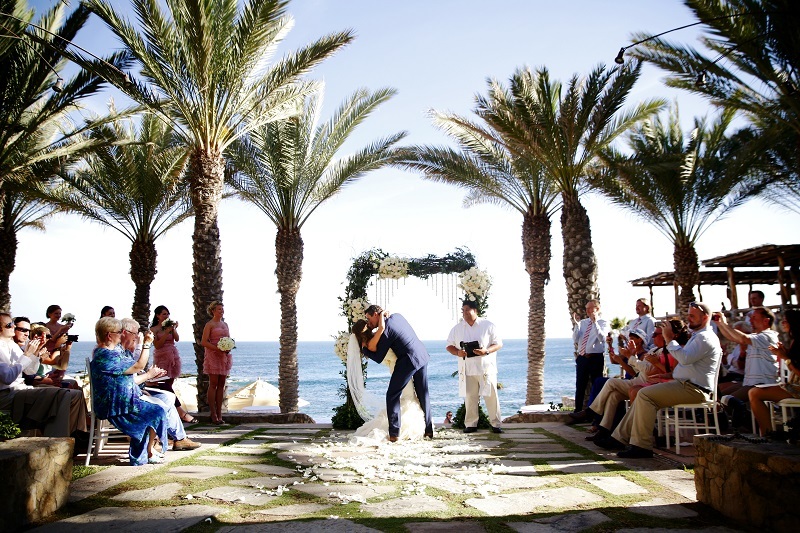 The ceremony took place on the tiered terraces overlooking the infinity pool and the Pacific Ocean. 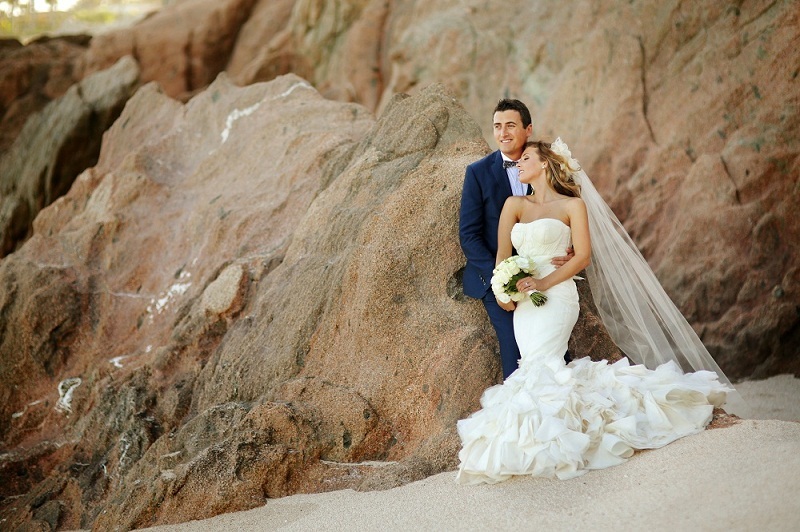 Nothing like a beautiful beach backdrop to mark the momentous occasion! 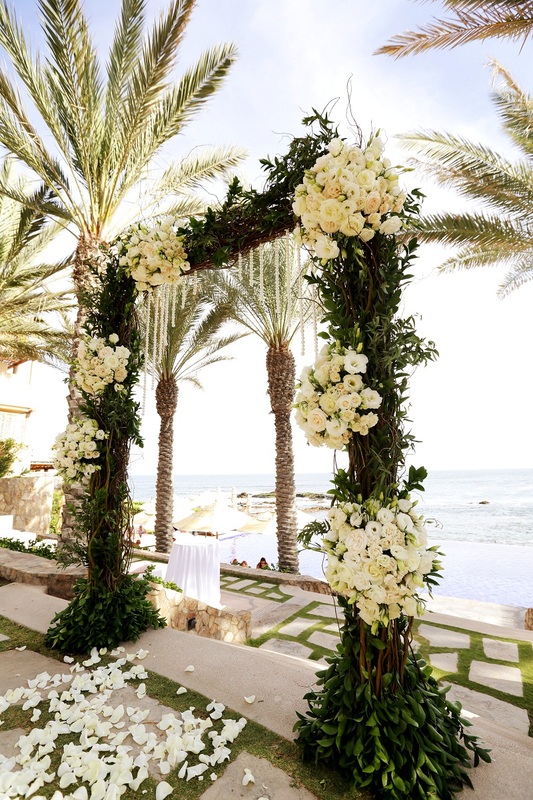 We designed a luxurious ceremony arch using fragrant ivory and blush flowers such as Garden Roses, Sweetheart Roses, Lisianthus, and Oriental Lilies gathered in loose bouquets attached to a modern garden structure covered with vines, branches, and tropical leaves. 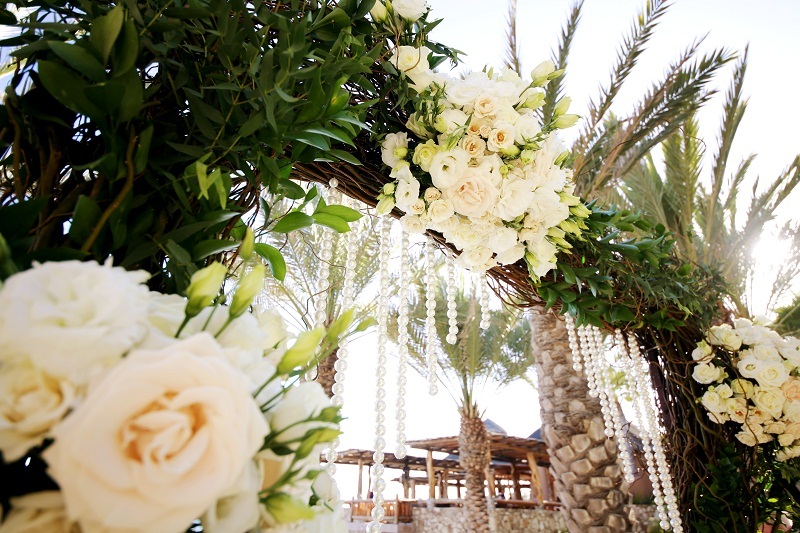 Strands of large pearls were attached to the arch in soft lines that drew your eye to the couple below. 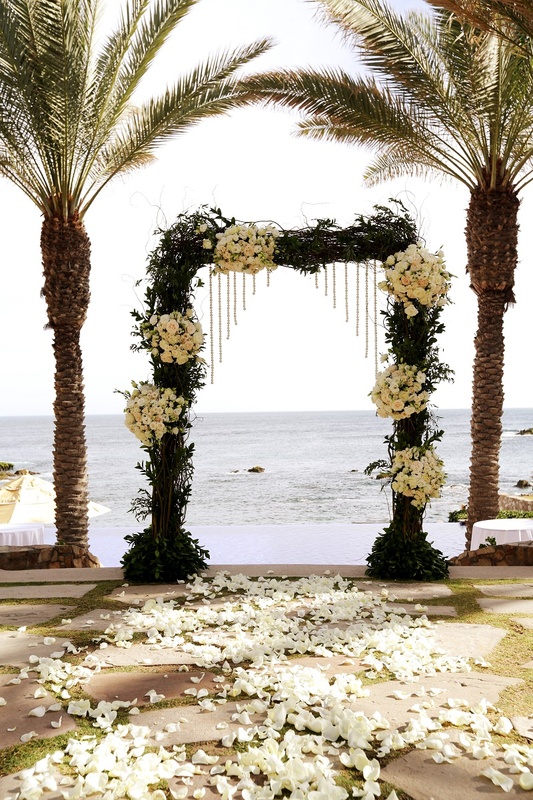 Of course, no ceremony aisle is complete without a scattering of delicious rose petals! After the wedding ceremony, and while their guests enjoyed cocktail and hors d’oeuvres at the cocktail reception, the newlyweds took advantage of the amazing setting for their formal portrait session. 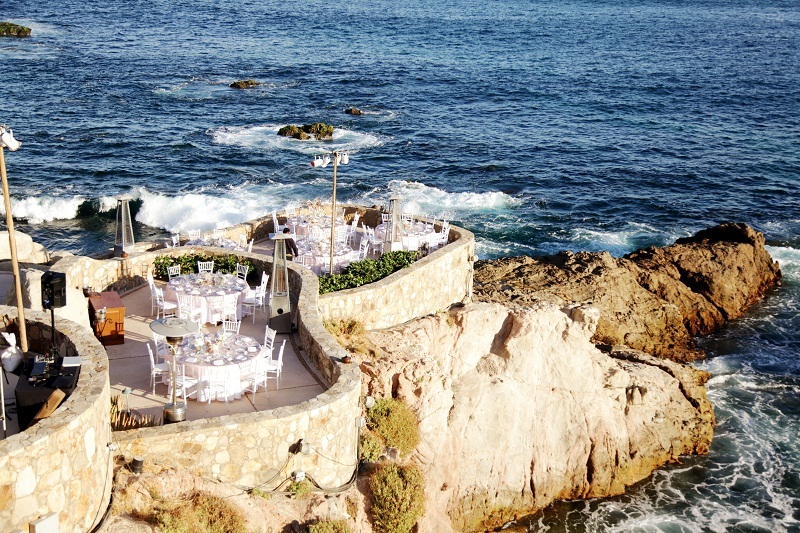 The dramatic settings kept coming as the dinner reception area at Esperanza is carved into the stone cliffs perched over the ocean! 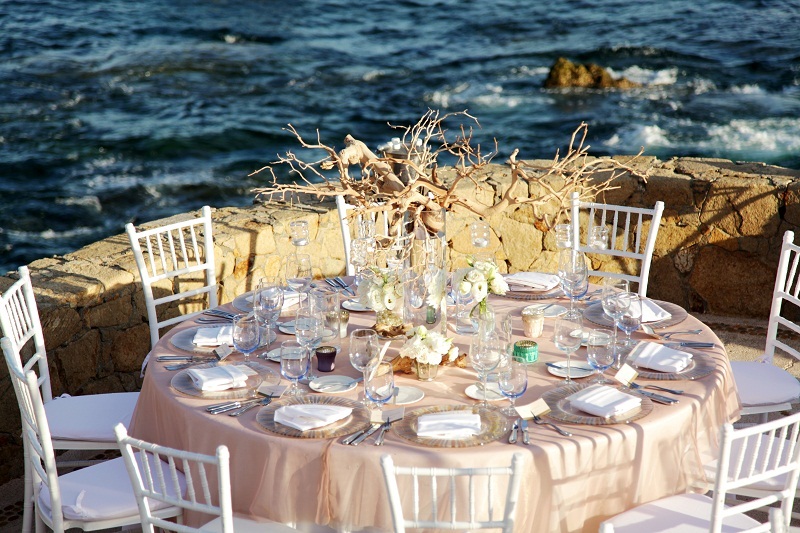 Keeping the magnificent sea view first and foremost in the guests minds, we worked with the bride to design naturally-inspired tablescapes for the dinner tables using custom-designed blush linens, manzanita branches, clear glass vases, and ivory flowers. As the sun set the entire reception area turned pale pink, just like the inside of a conch shell! Choosing to skip the traditional wedding cake, Erica and Erich took advantage of the Five Star culinary team available to them at Esperanza and served a delectable white chocolate raspberry cheesecake and French macarons for dessert! Together with their signature wedding drinks, the Cabo Green Margarita and a Watermelon Mojito (YUM! 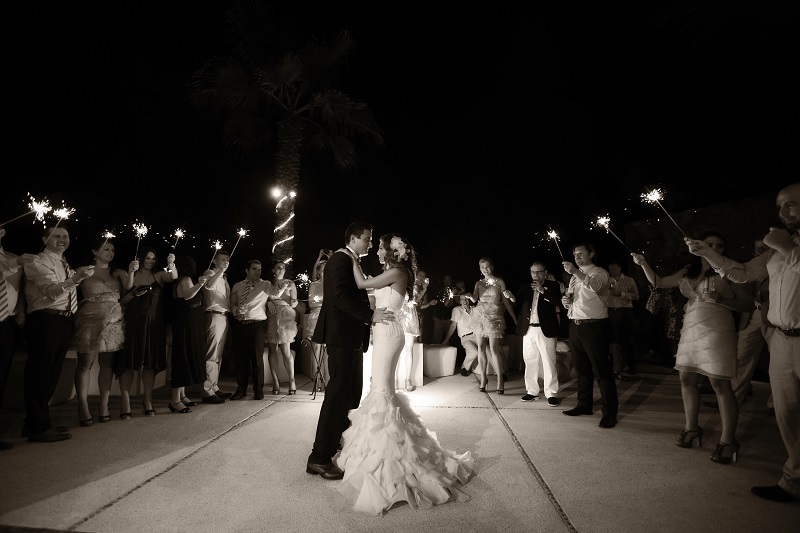 ), their wedding menu was a festive feast from start to finish. 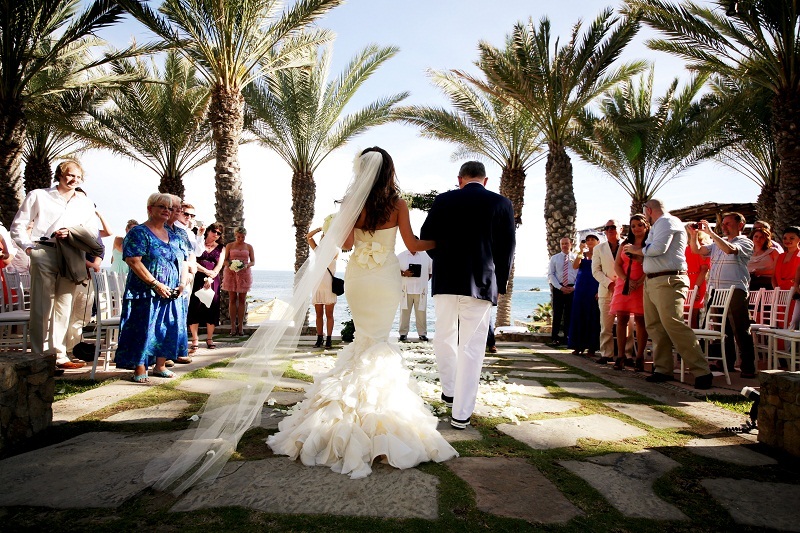 This elegant destination wedding was petite in stature but grand in design! 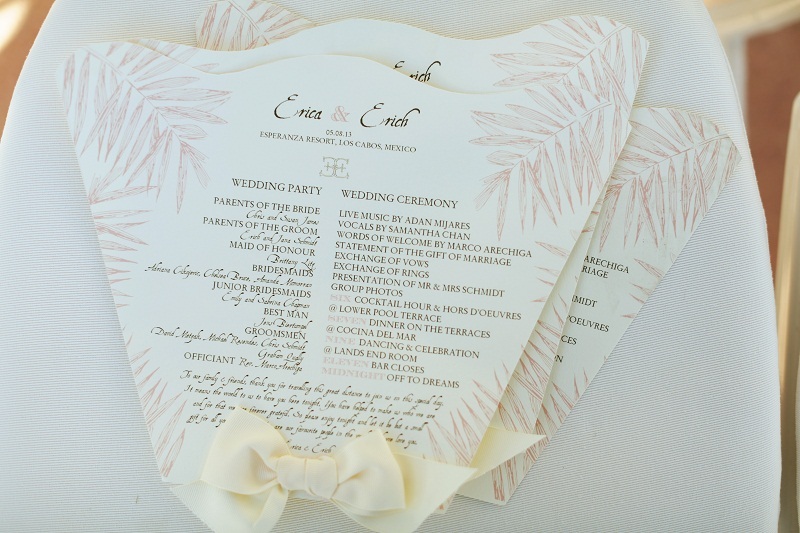 From the sweet pink palm trees on the pearlescent menu cards to the “sparkling” first dance. Details, details, details… It’s what we do at Elena Damy!